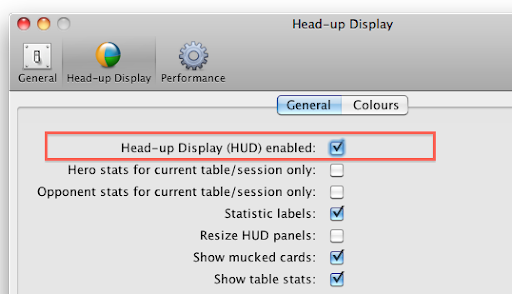 Officially, Poker Copilot requires Mac OS X 10.5 (Leopard) or higher. However Tiger users are still able to use Poker Copilot, albeit with some unusual rendering and with a couple of features missing. Poker Copilot 2.73 doesn’t seem to be working with Tiger at all. I’m investigating the cause, but for now you can download Poker Copilot 2.72, which does work with Tiger. You can download Poker Copilot 2.72 here. For now, I’ve made the Poker Copilot home page and downloads page offer 2.72, until I solve this problem. Update: If you are feeling adventurous, please try this Poker Copilot update which might work with Tiger. If you try it, please post in the comments whether it worked for you. 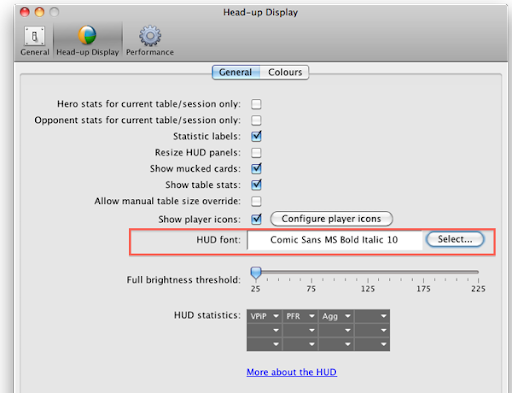 There’s a new preference in the Head-up Display preferences panel that enables you to completely disable the Poker Copilot head-up display (HUD). For most people the HUD is the killer feature in Poker Copilot. But there are some people who just use the analysis features and find the HUD distracting. 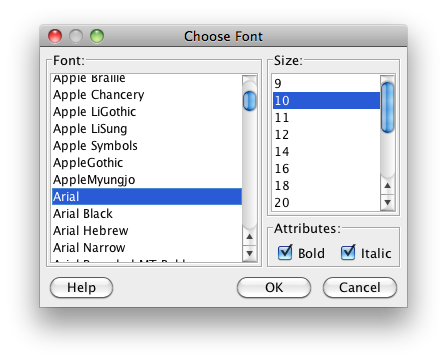 Coming in the next update: I Can Has Comic Sans? Wondering what Poker Copilot’s player icons mean? Here are some definitions. Rock Is very tight preflop. If this player puts money in the pot pre-flop, chances are he’s got a premium hand. Whale Plays almost anything. In poker a whale is a big fish. Fish Plays too many marginal hands. Calling Station Limps/calls too much. These players are hard to bluff, as they like to see how the flop unfolds. Even when they don’t hit the flop, they’ll often keep putting money into the pot. Gambler Plays many types of hands, and if he reaches the flop, plays aggressively post-flop. Maniac If he puts money into the flop, doesn’t like to be outbet pre-flop. You’ll need to be prepared to often commit a lot of chips against these players. Eagle Plays a very solid all-round game, especially pre-flop. Book Plays very predictably. This player reads a poker book or two and follows them exactly. Red Circle, Green Triangle, Blue Square, Yellow Star These are extra symbols you can use with your own rules. Indefinable A player who playing style doesn’t fall into any of the other categories. After each hand, the amount you’ve won or lost in the session is updated and shown in the menu bar (aka status bar). Blue for positive amounts, red for negative amounts. 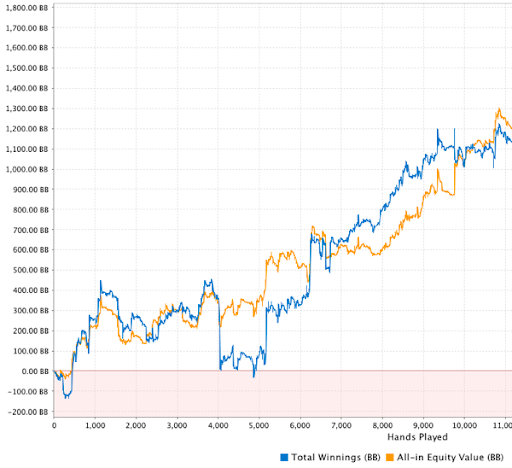 A long-standing issue in Poker Copilot is that the All-in EV Chart is not very useful for tournaments. Using chips instead of big blinds as the y-axis distorts the chart. Unless you win a tournament, you’ll always incur during the tournament a positive EV diff of about 1500 tournament chips – assuming that each player starts with 1500 chips. If you come second in a 10,000 person tournament, you’ll normally win a lot of money. But your EV diff will still show +1500 tournament chips. By using big blinds as the y-axis, the numbers are somewhat normalised. I still don’t think the numbers are perfect, but I can’t quite work out why. For both the freelancer and the poker player goes the same things. They have to be mentally fit every day, and more importantly, every time he sits at the poker table or in front of the computer to get creative. The only way to do this is by getting exercise and taking plenty of time away from the computer to stress of and think of anything else than work/poker. Read Slovenian? Then read a Poker Copilot review here. Random Slovenian trivia: the language has a singular word for beer (pivo), a plural word for beer (piva), and a word for exactly two beers (pivi). Google Translate offers proof.